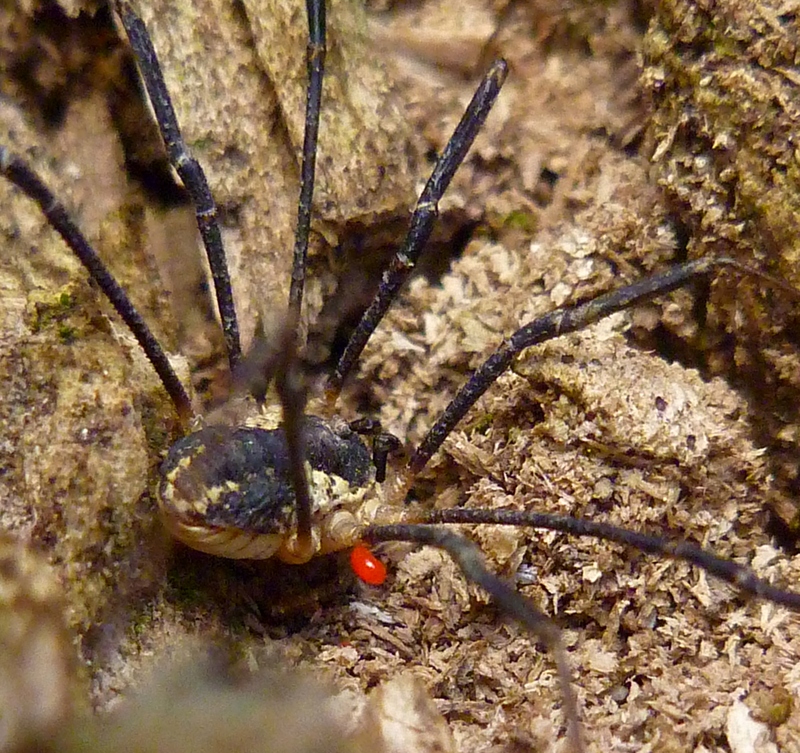 In the last post on Rilaena triangularis, I mentioned that there are only very few species of harvestmen that are adult around this time of year. One of them is Platynunus pinetorum, but this species is not very common in most northern European countries. Today I went looking for it in the forest, and hurray, I found one! P. pinetorum originally occured in central Europe, but over the past two decades it has moved northwards. In Belgium it was first recorded in 1992 and in the Netherlands in 1998. Also in Germany, where it already occurred, the species is becoming more and more abundant. Only a few years ago (2010) there was a first sighting in Sheffield in the UK. As already indicated by its name, this species is often found on coniferous trees, such as pine. 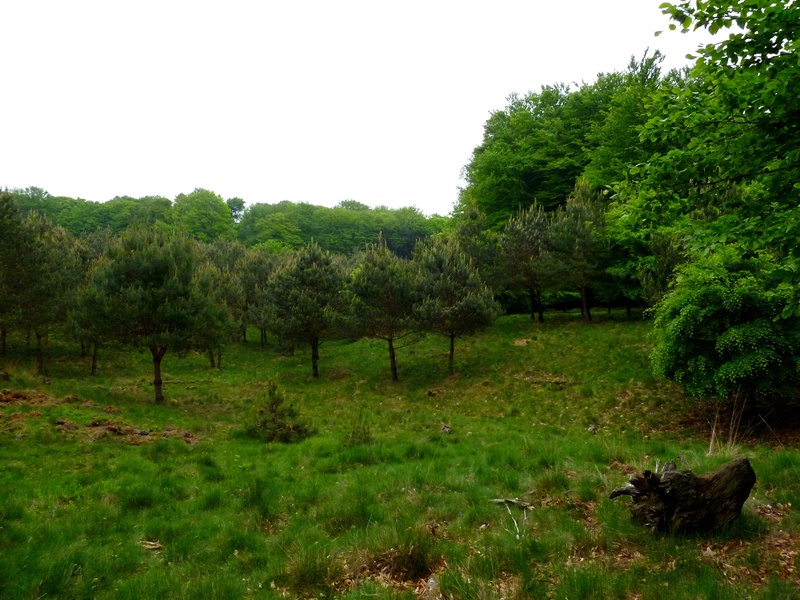 This is the area where I was today, with nice low pine trees so that it’s easy to shake the branches. 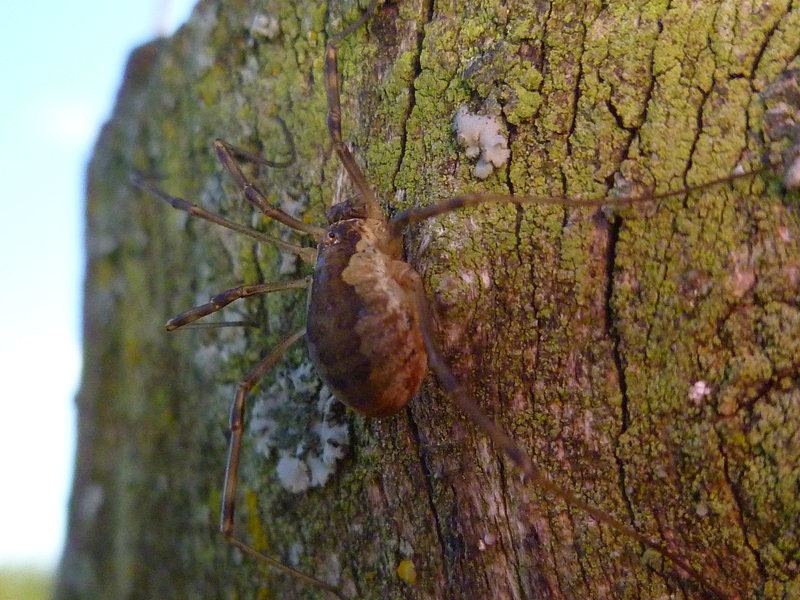 P. pinetorum is a very good-looking harvestman, if I may say so. It is rather large (5-8 mm) and has a very dark colour. 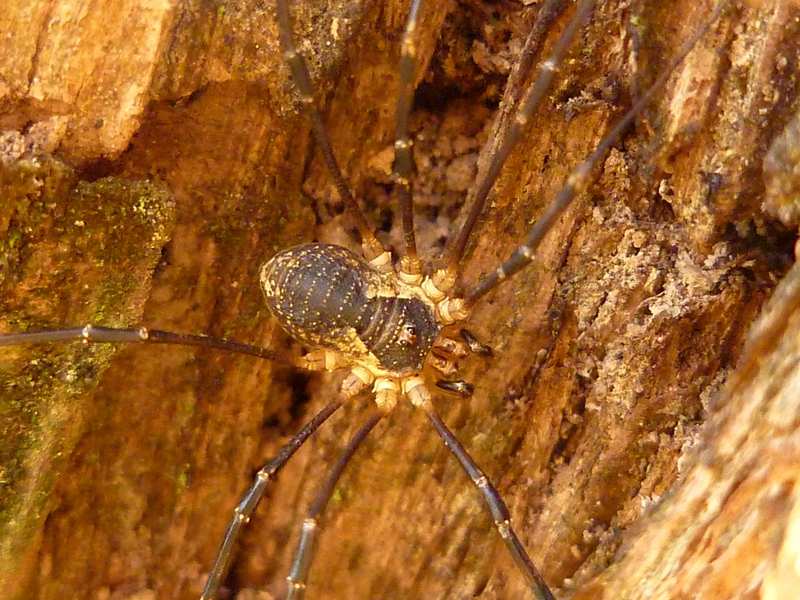 The body of a male is completely black, with brown legs, while the female is dark brown with a saddle of black and white (so, the one pictured here is a female). They have a row of white spikes running along the underside of the palps, pointing forward when the palps are drawn in (visible on the first two pictures above). On the picture below a view of it’s cute white belly. I take a picture of every specimen I find, so that more experienced people can check the determination before they are entered into the database of the Netherlands. Luckily there are so few species living here that they mostly can be recognized from a picture. A light-coloured umbrella is very handy to find specimens that sit in bushes or in the lower parts of trees. Open up the umbrella and place it upside down under the branches, then shake the braches or hit them a few times with a stick so that all invertebrates fall into the umbrella (like this). So, I’m off for today! 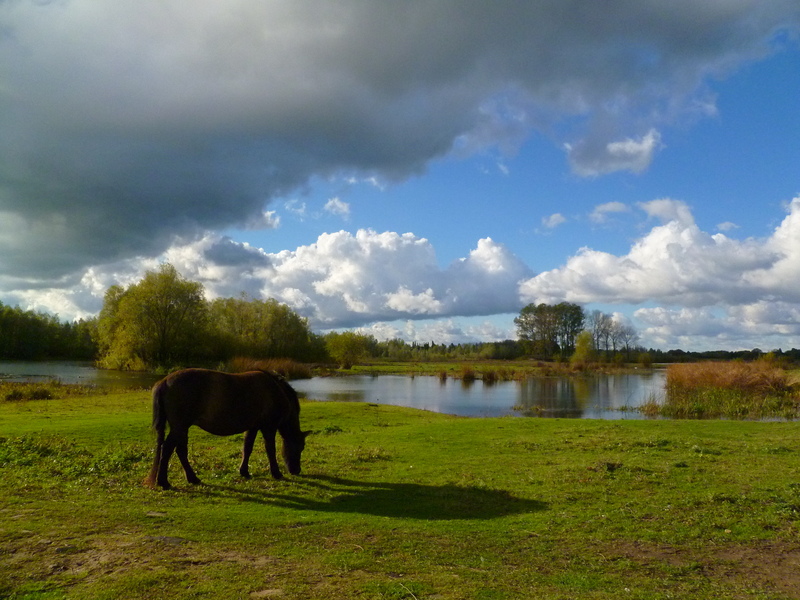 Last weekend my husband and I set off to the IJssel river forelands to take a walk. 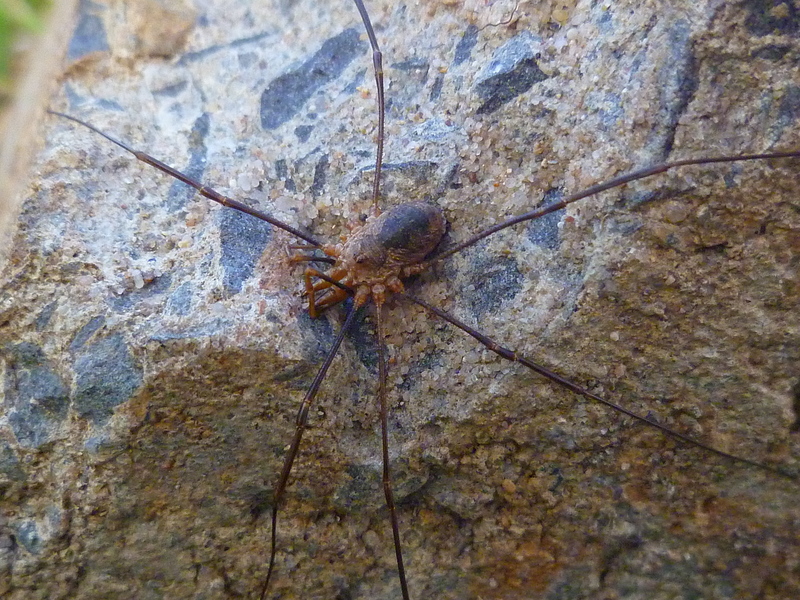 And of course I had to look for harvestmen along the way. 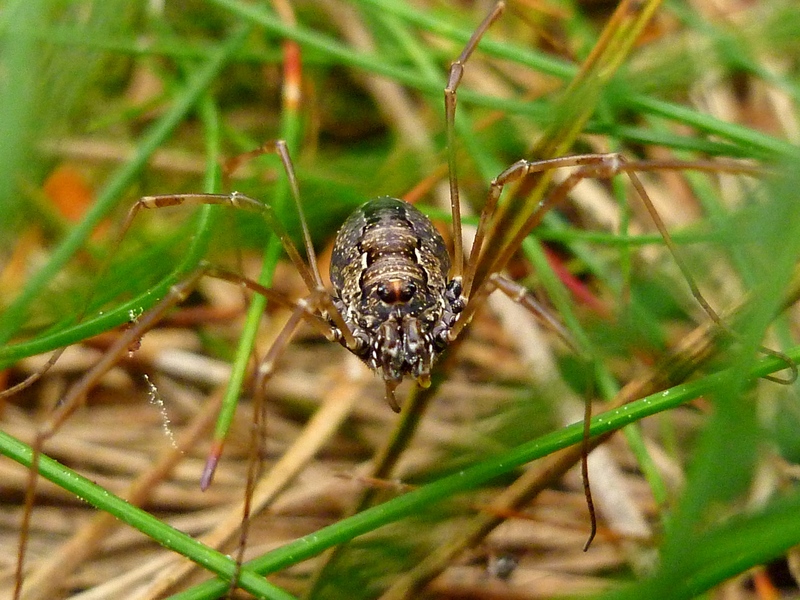 I especially went looking for Astrobunus laevipes, a small harvestman (2,5 – 4 mm) with two rows of blunt spikes running over its back. 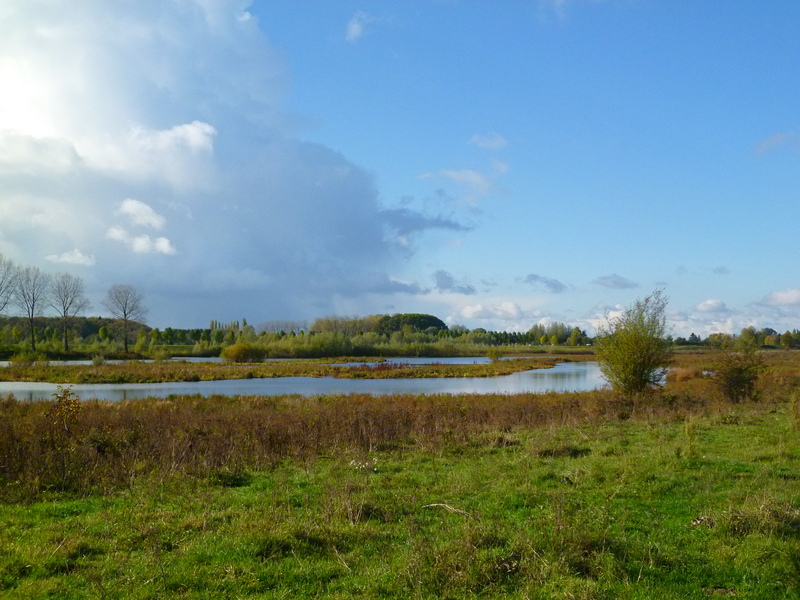 It is an originally southern European species, that has been found for the first time in the Netherlands in 20031. 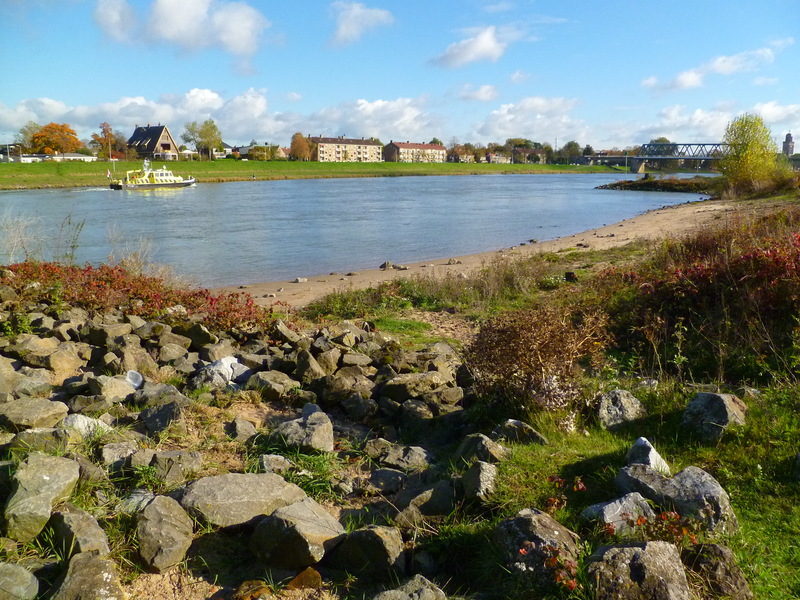 It is expected to live along the IJssel, but the area has not been searched often so it has not (yet) been found. We turned over many small rocks, but unfortunately weren’t able to detect one. At the end of the walk we found 3 specimens of Mitopus morio, which made me very happy as I had not seen this species before. 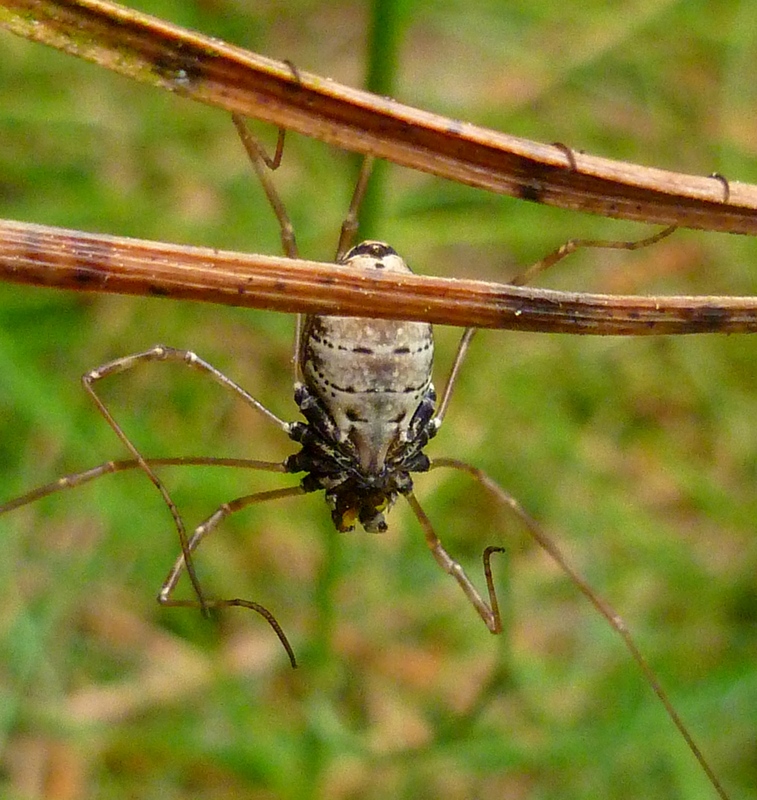 So, al in all, a nice walk, harvestmen-wise and otherwise! 1. 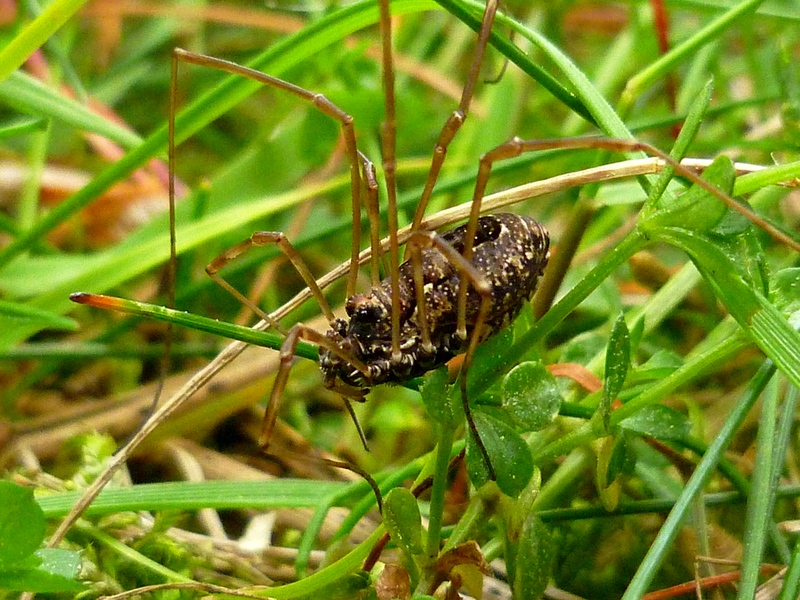 H. Wijnhoven (2003) De hooiwagen Astrobunus laevipes nieuw voor Nederland (Opiliones: Phalangiidae). Nederlandse Faunistische Mededelingen 19: 73-78. Link to article.